It is known that actor Suriya has turned producer and now it is official that his first production film to be directed by Pandiraj is titled as Haiku. Suriya’s maiden production tentatively titled as Production No.1 under the home banner of 2D Entertainment started rolling before few months. 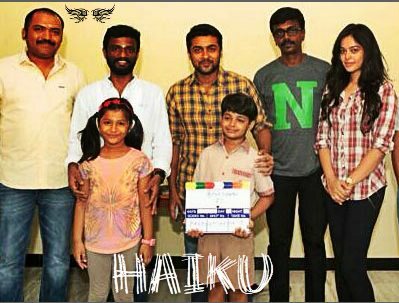 With the film close on the heels of completion, this film directed by Pasanga fame Pandiraj has obtained the title of ‘Haiku’. The film is based on the children much alike the previous films of Pandiraj titled as ‘Pasanga’ and ‘Marina’. With this film, the director would be completed the trilogies of children genre, which is a rarity in Indian cinema these days. The film stars Bindu Madhavi in an important character and Suriya along with Amala Paul will be playing an important role. Initially, Malayalam actress Manju Warrier of How old are you was reported of playing this role, but later Amala Paul came into the picture. Suriya has earlier turned distributor with his Hari directed "Singam 2". Starting with this children film 'Haiku', Suriya's 2D Entertainments is also funding for his upcoming Venkat Prabhu directing Masss and Jyothika's comeback film the untitled 'How Old Are You' Tamil remake. Co-produced by Pasanga Productions, Pandiraj will soon resume Haiku shooting.